The pleasure boat paradigm began shifting in the middle of the 20th Century. Simultaneous developments in the United States and Great Britain ushered in the era of long range voyaging under power. In southern California, naval architect Arthur DeFever, who designed most of the tuna and sardine fish boats built in the 1950’s, was a member of the Offshore Cruising Club. Virtually every member of the club was a sailor, but a small group of members approached DeFever to discuss designing and building cruising powerboats with the same long range capability, fuel efficiency, and seaworthy design of DeFever’s renowned fish boats. It is possible to frame a valid argument that the custom boats created for members of the Offshore Cruising Club of San Diego were among the first cruising pleasure boats designated “trawlers”. About the same time that Arthur DeFever was applying work boat principles to a new concept of long range offshore cruisers, Great Britain began reducing its fishing fleet in the North Sea. The government extinguished the rights of hundreds of commercial fishers, purchasing the surplus boats in the process. By the mid 1950’s, the mothballed fish boats could be purchased very cheaply- but could no longer be used for fishing in British waters. An initial few trawlers were converted to pleasure boats, and proved so successful that within a few years nearly all available surplus North Sea trawlers were converted to long range, offshore, pleasure cruisers. Throughout the 1950’s, virtually all pleasure trawlers were one-off custom designs or commercial conversions. In the early 1960’s, growing demand for economical, seaworthy, pleasure boats capable of cruising long distances under power inspired some shipyards to begin producing boats built to a standard plan. Certainly among the earliest in this endeavor was American Marine, producing Grand Banks. Trawlers have continued to evolve. During the 1970’s nearly all production builders switched from wood to fiberglass- although steel, aluminum, and other materials are represented as well. In 1975, Robert Beebe published a book summarizing about 30 years of his own long range cruising experience, “Voyaging Under Power”. For most offshore cruisers, the principles incorporated in “Voyaging Under Power” define the essential characteristics of a serious, seagoing, vessel. The term “trawler” now refers almost exclusively to power boats. The category didn’t emerge from a vacuum and owes a great deal to the tradition of offshore voyaging under sail. 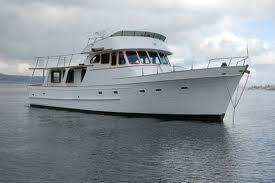 Trawler designs very definitely evolved from time tested, workboat concepts.